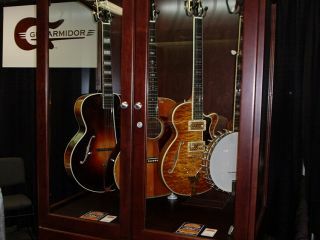 One of the more intriguing products we saw at the recent NAMM show was The Guitarmidor. It's basically what it sounds like - a temperature-controlled cabinet for your guitars. But at over $14,000 for just the starter model, clearly this is a luxury item. As luxury items go, however, it's something to behold. In short, The Guitarmidor is a piece of heirloom-quality furniture with a high-technology component that allows a user to regulate both temperature and humidity in a controlled space for the preservation and display of fine guitars or other stringed instruments. Where Guitarmidor truly differentiates itself in the market is around the interior cabinet environment itself. Its technology allows a user to control both temperature and humidity as two independent variables to within +/- 1% of the desired setting. Sounds good, but what about the price? Well, let's just say that the Guitarmidor isn't made for your beat-up knock-off. The G-400 sells for $19,500 in either oak or maple. Special requests and other exotic woods are possible (and may run higher). There is a smaller version of the Guitarmidor, the G-200, which sells for $14,600 in either oak or maple. Got some precious babies that need tender loving care? The Guitarmidor may be for you. Visit the official Guitarmidor website for more information. For the rest of us, tweed cases will just have to do.